In a measuring jug, add coconut milk, maple syrup to taste and chia seeds. Whisk with a fork until well combined. Then cover the jug with a cling wrap and refrigerate for at least an hour.When you are ready to serve, give the mixture a quick stir with fork. 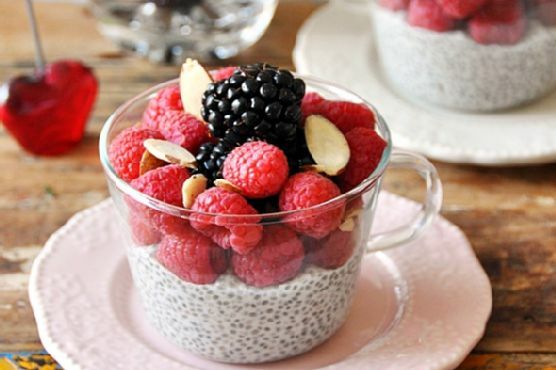 Divide the chia seeds pudding equally in 3 glasses and top with berries and almond flakes. Finish with a light drizzle of maple syrup if preferred. Cream Sherry, Moscato d'Asti, and Port are great choices for Pudding. A common wine pairing rule is to make sure your wine is sweeter than your food. Delicate desserts go well with Moscato d'Asti, nutty desserts with cream sherry, and caramel or chocolate desserts pair well with port.